The project is based around the compositions and arrangement of front man Eyal Amir, RnL keyboard player and producer, who began his unique and remarkably inspired works in 2003. Amir was attending Rimon School of Jazz & Contemporary Music in Ramat HaSharon, a suburb of Tel Aviv, Israel, when he met anomalous vocalist, Ray Livnat. The duo formed a musical compatibility that would prove to be difficult to parallel despite countless projects and collaborations with other artists from around the world. In 2010 they formed Project RnL, which stands for Rock n’ LOL, in reference to the band’s humorous and unpretentious approach to their art. They swiftly recruited a myriad of accomplished players and vocalists to perform Amir’s challenging yet danceable grooves and epic rock riffs. The addition of guitarist Alon Tamir, took no consideration, he originally began working with the pair on various projects in 2007, since then Alon’s consistently flawless performances had continued to diminish their urge to work with anyone else. 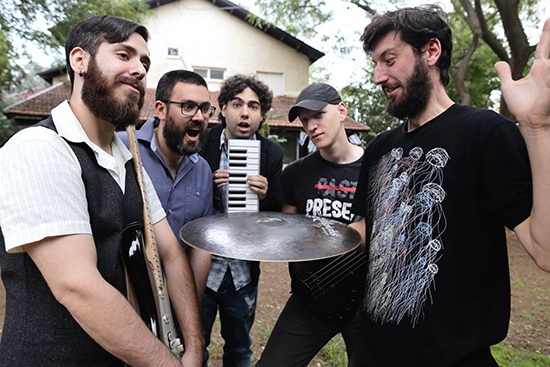 The project proceeded to create one viral hit after another, drawing attention with their effortless journeys through 70’s style progressive rock, jazz fusion, modern rock and even bizarre electro pop showcasing Amir’s stunning vocal arrangements as they ebb and flow in blissful cascades of iconic pop production. The amusing and tasteful production of their videos wowed viewers world-wide. Soon RnL’s offerings on YouTube drew a big following and reached millions of people on the net. RnL’s rapid popularity caught the attention of many big names and suddenly they were collaborating with respected artists such as Jordan Rudess (Dream Theater), Jeff Berlin, Pomplamoose, and The Living Tombstone. Rudess continued to work extensively with the band and its members and within a year, Amir found himself living New York City, collaborating with Jordan and many other notable names. He spent the following 2 years immersing himself in New York’s music performance, production, education and technology scenes, meanwhile in Tel Aviv, Ray remained to form eccentric progressive group Anakdota. As 2013 drew to an end an overwhelming feeling that he left something unfinished behind, something more than he was finding in the States, convinced Amir it was time to return to Israel. Although originally intended as a purely studio entity, Project RnL inevitably made the jump to a live environment almost instantly upon Amir’s return from NYC. Ray and Alon were ready and eager to embark on the necessary adventure they had all nearly missed, along with previous drummer, Dekel Dvir, however they still needed one more thing. In the past they had worked with many talented bass players, often someone new at each session, yet had never settled with one. The band put out an ad on Facebook that read, “I’m looking for the best bass player you know” and bassist Or Lubianiker responded. Or’s witty response was a sure sign his confidence and humor, both on and off stage, and it was no joke, he fit the requirement perfectly. Already in shape from touring with Marty Friedman and Yossi Sassi, he was ready immediately, and in no time the band was selling out shows. Project RnL is a group that must be seen in order to believe, from the energy, to the technique, the truly genuine vibe, the rush from one perfect rock riff to the next, the group’s effortless execution of the complex time signatures and air-tight layered arrangements, they deliver a virtuoso performance on all instruments. Ray’s unparalleled vocal style and incredible range seems more like the voice of an instrument than a human. Tamir’s expertly executed guitar totally shreds, in exactly the way you were hoping for, every time. Bassist Or Lubianiker’s playing is hauntingly sublime and new drummer Sharon Petrover is out of this world. The band is currently in the studio working to complete their new studio album for release in the spring, 2016. Check them out at their performance at NAMM in January, or on their Europe Tour February 17th – March 20th with Ozric Tentacles.